Roger Federer has his work cut out for him at the 2012 Mutua Madrid Open, which will be played on blue clay for the first time ever. 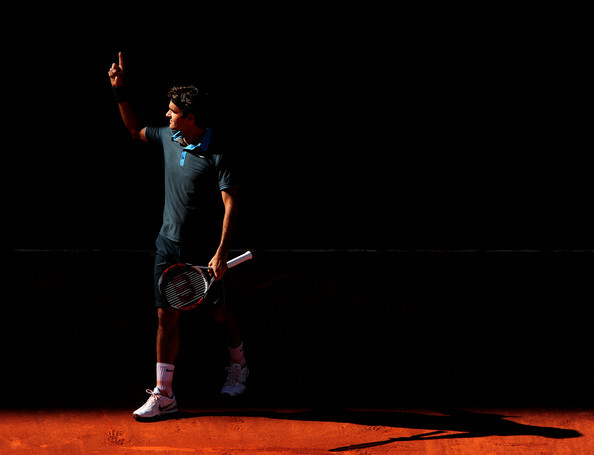 Roger has a very tough draw in his first clay event of the 2012 season. He will either face old foe David Nalbandian or young rising Canadian star Milos Raonic in his opening match. He will have practically no time at all to get into prime match shape as both are dangerous opponents. Fed had to be at his best to get by Raonic in Indian Wells a few months ago and Nalbandian always poses a threat - he was Fed's hardest opponent before Nadal came along for a reason. Raonic also beat Andy Murray in the Barcelona quarters last week and definitely does not mind playing on clay, even though he is a better hard court player. Should Roger get by his tough opener, he should make it to the semifinals. He's likely to get Richard Gasquet or Thomaz Bellucci in the 3rd round, whom, while tough players, are beatable if Roger is at his best. I know Fed will want to avenge his clay defeat at Rome last year should he face Gasquet. In the quarters, David Ferrer awaits. David is a guy that always gives Roger a tough match but has never been able to get a victory against him. He would give Roger a stern test, but again, if the Fed plays his best, I don't think Ferrer will be able to win. Rafa has a simple draw, made even simpler by the fact that Andy Murray will not be playing. He withdrew due to a back injury. Nadal will get either Davydenko or Karlovic in his opening match. Either one of them theoretically could pose a challenge but they will likely not. Verdasco is the likely 3rd round opponent but Rafa pretty much owns him on clay. Berdych or Monfils are set to play him in the quarters. Overall, Berdych is the biggest challenge for Rafa until the semis where he will face Isner, del Potro, or the #4 seed, Tsonga, barring any upsets. Djokovic also has an easy draw. After a qualifier in his opener, he'll (likely) play Stan Wawrinka or Feliciano Lopez. After that, Gilles Simon or countryman Janko Tipsarevic are his potential quarterfinal opponents. It will be interesting to see what frame of mind Novak is in after the passing of his grandfather, and whether or not he will be affected at all by the beating he took from Nadal in Monte Carlo. I personally hope he isn't because a Federer vs Djokovic match would be fun to watch. Juan Martin del Potro is the dark horse in this tournament. The clay and altitude suit his style of game and it would be absolutely lovely to see him get a win over Rafa in the semis. My dream scenario is one where Roger beats Djokovic in the semis, then beats Delpo in the finals after the big Argentine takes out the Spaniard. As of this writing, Delpo is in the final of Estoril against Gasquet, so he should be in great form looking to cause trouble for the top players. Even though Federer has a very daunting draw, I am confident he can get through to the semis unscathed. He usually does very well when faced with a tough draw, and recent evidence of this can be drawn from Indian Wells, where he had to go through Raonic, Bellucci, del Potro, Nadal, and Isner to win. The Madrid clay has arguably been his best clay surface since 2009 and he definitely wants to get his clay season off on the right foot. Here's hoping for a great tournament and hopefully in the end, title #4 of 2012 for Roger! It will be difficult, but I have complete confidence in Roger's ability to come out on top in the end. Tennis has been very dull to me since Roger lost to Roddick in Miami over a month ago, so with the Swiss Genius back, I am starting to get tennis fever again. And just in time too, because I will be playing tennis again for the first time in 8 months next week.